The BBC journalist and presenter Caroline Wyatt has been awarded an honorary doctorate by City, University of London. Dr Wyatt is an alumna of City and graduated with a postgraduate diploma in periodical journalism in 1990. She was made a Doctor of Arts in recognition of her outstanding contribution to the profession of journalism, at a graduation ceremony on Wednesday 19th July 2017. Speaking at the event, Dr Wyatt said: “I am exceedingly grateful for the honour you have conferred upon me and absolutely delighted to join you as you celebrate your graduation. 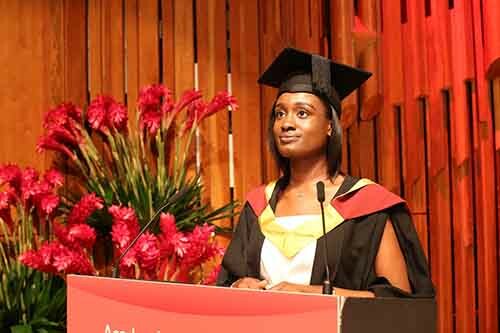 The journalist was presented with her degree by City’s President, Professor Sir Paul Curran, at the Barbican Centre in London. The award was conferred during a graduation ceremony for students from the Department of Journalism at City. Dr Wyatt offered the students some inspiring words of advice. “Success in the world is not measured only in titles or salary or benefits," she said, "but in the riches of a close family and friends, and of knowing that you are doing the best that you possibly can." During a distinguished 25-year career at the BBC, Dr Wyatt has developed a reputation as an exceptional foreign correspondent, with postings in Germany, Russia and France. She has also reported from other countries across Europe, the Middle East, Asia and Africa. She has been the BBC’s defence correspondent and most recently religious affairs correspondent. In 2016, Dr Wyatt stepped down from her role as a correspondent after being diagnosed with multiple sclerosis, but continues to work as a journalist and presenter for the BBC. 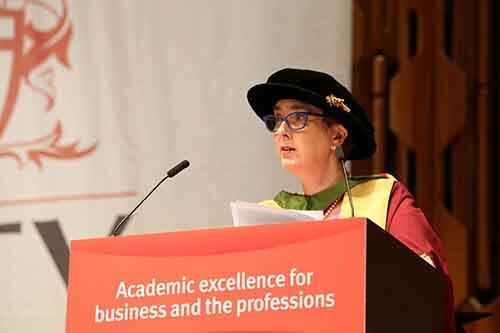 Professor Suzanne Franks, Head of Journalism at City, said: “Caroline is a wonderful example to our students and, as an alumna of City, is a great credit to the university. The ceremony also saw 2017 journalism graduate Bethany Walker (right) welcomed to the stage as this year’s student speaker.